Notre Histoire (volume 1, 2014) recounts the story of Mariana Thuram, mother of famed Guadeloupian footballer-turned-activist Lilian Thuram, and focuses on her fortitude and the fortitude of those before her and like her who actively work towards providing a better future for their children. As mentioned on the title page of this recent publication from Éditions Delcourt, the story is loosely inspired by the essay Mes Étoiles noires, de Lucy à Barack Obama by Thuram and Bernard Filaire published in 2010 by Éditions Philippe Rey. As Thuram explains in the introduction to Notre Histoire, this bande dessinée takes up the story of his first star, his mother, while also introducing readers to other stars, in this case, important historical figures whose legacies and contributions are often overlooked and also elements of traditional African culture, in particular from Fulani culture. Written by Jean-Christophe Camus (artistic director of Delcourt and author of the autobiographically-inspired Negrinha), illustrated by Spanish Sam Garcia (Lunes birmanes), and colored by Hugo Poupelin, Notre Histoire uses Thuram’s personal family history both as an emblem of other family histories and as a vehicle to open up our understanding of history as an experienced shared by all. 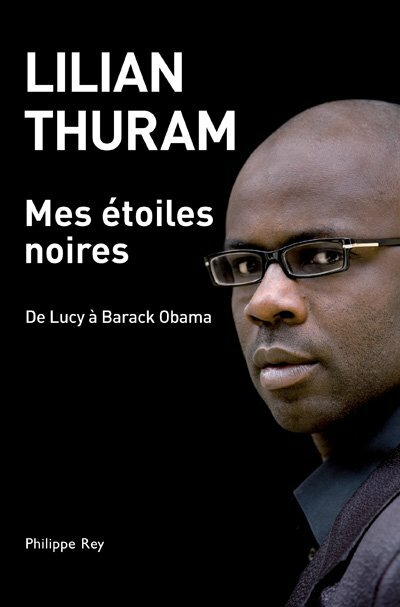 Notre Histoire draws on Thuram’s celebrity by offering readers an authentic look into his humble beginnings. The text even includes a bonus section with reproductions of Thuram’s family photographs and preparatory sketches by Garcia for the bande dessinée. Indeed, Notre Histoire is an example of a recent trend in which public figures not normally associated with the 9th art produce autobiographically-inspired bandes dessinées and picture books as a means of introducing enriching historical perspectives to a multicultural contemporary French-speaking readership. Examples include Azouz Begag’s Leçons coloniales (2012) illustrated by artist Djillali Defali and Alain Mabanckou’s Ma Soeur-étoile (2010) illustrated by artist Judith Gueyfier. In each of these cases, the format is meant to appeal to a broad audience, thus engaging a wide range of readers with the authors’ personal stories. Starting in the summer of 1980, Notre Histoire tracks Mariana’s decision to leave the hard work of the sugar cane fields and of housekeeping in Guadeloupe (difficult and physically demanding jobs that fail to provide her a decent income to adequately support herself and her five children) for better-paying jobs in France. Though there are those in her community that question the wisdom and plausibility of her decision as she must travel alone and leave her children behind while she earns enough to bring all of them to France and support them, Mariana’s courage and determination lead to young Lilian (aged 8 in the text) and his siblings moving to France a year later. Once in France, Lilian and his siblings happily take to learning new customs and adapting to differences in weather, cuisine, and culture. Interestingly enough, as their first home-cooked meal in France, Mariana prepares them couscous, which she explains is a dish that everyone in France eats—a not-so-subtle indication of the always already hybrid nature of French culture and of the ways in which the effects of France’s long-reaching geopolitical history manifest in everyday life. At first, the Thurams live with Mariana’s boyfriend and his daughter. However, after tension arises between the couple, Mariana arranges for her family to move to a different apartment all in one day to give her former boyfriend the slip. The family moves to a new apartment located in an HLM (habitation à loyer modéré) in Fourgères (northeast of Rennes) and it is in this new neighborhood that young Lilian befriends an old man, Neddo. It is also at this point in the text (little more than half way) that Notre Histoire shifts from being about Thuram’s family history to being about a shared diasporic history. By teaching readers (young and old alike) through young Lilian about slavery in the Caribbean and about forgotten and underappreciated black historical figures, in particular Commander Louis Delgrès and Solitude who, in 1802, fought against the reinstatement of slavery in Guadeloupe under Emperor Napoleon, and Haitian scientist Joseph Anténor Firmin who, after much research, published De l’égalité des races humaines – Anthropologie positive in 1885 as a refutation of Arthur de Gobineau’s ubiquitous Essai sur les inégalités des races humaines (1853-1855), Neddo explains how preconceived notions of the past are based on certain versions of history. Moreover, at the end of the text is a list of definitions of key historical terms, events, and laws pertaining to the global history of inequality. Young Lilian’s curiosity about and passion for such historical figures and events is meant to find an echo in the reader through Garcia’s dramatic renderings of the past and Poupelin’s dynamic and cinematic color palette. Implied in Neddo’s recounting is the fact that there are many important events and people that risk being forgotten due to the power dynamics of remembering. Ultimately, these fascinating histories (and Notre Histoire itself) demonstrate how racism and all forms of prejudice are social constructs and that knowledge and education are the best tools for changing such constructs.